This fun, easy project creates a very unique candle. There are many different looks that can be created with this simple process. Even when you use the same colors and fragrance, no two candles will be the same. Let your imagination be your limit. You can do a second pour after you have poured out the water and fill the holes with a different color, or pour layers of different colors. 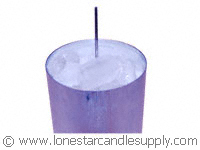 You can even insert a core candle in the center and pour the ice around the core candle. The possibilities are almost endless. Be creative, and have fun! 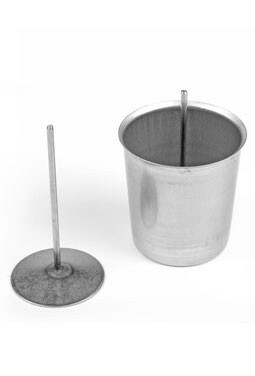 *If you are purchasing on of our Pillar Molds, these items will come with the mold. You will not need to purchase these items separately. The amount of wax required should be weighed out. 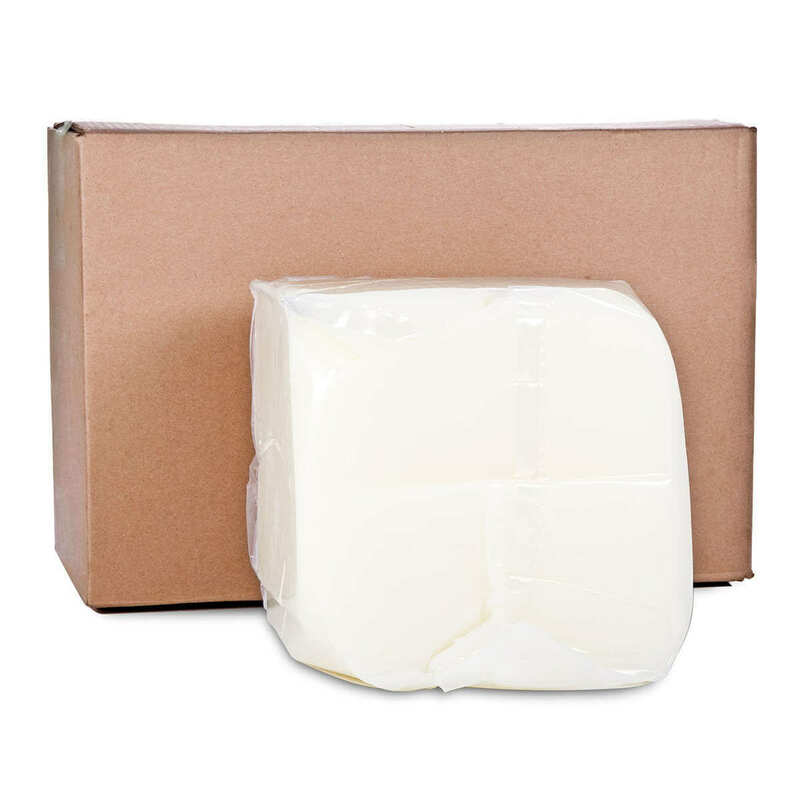 If you are using one of the molds we carry, you can find the recommended amount of wax in the description box on the product page. Cutting the pillar waxes can be tricky. 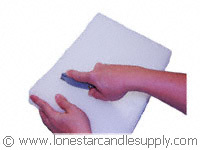 For this demonstration, the wax is scored with a utility knife. Then, the scored piece is placed on the remaining slab and pressure is applied to help break the wax on the score. 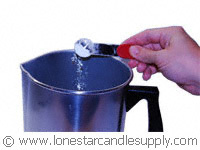 You may need to do this a few times to get the wax in small enough pieces to fit in the pouring pot. 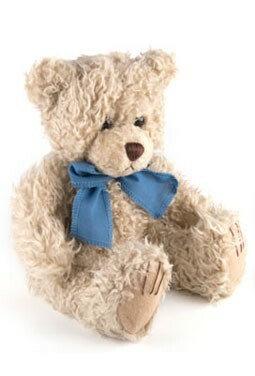 (Be careful not to cut yourself or smash your fingers while doing this.) 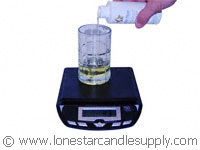 The wax can be weighed in the pouring pot so you do not have to transfer it from a different container. 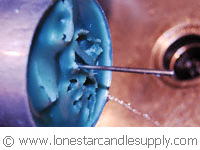 The wax will need to be heated to 175o to 185o depending on the wax you have chosen. 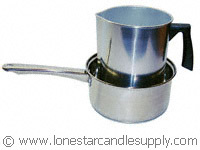 To create a double boiler, put about an inch of water in the sauce pan, and then place the pouring pot in the water. 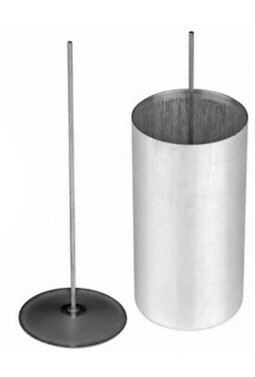 It is a good idea to add an inexpensive metal trivet or cookie cutter under the pouring pot to elevate it. 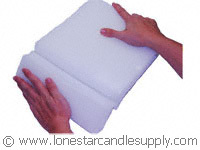 Doing this ensures the wax is not receiving direct heat from any side. Adjust the heat to a medium-low setting. The water needs to be boiling, but it does not have to come to a rolling boil. If the water is at a rolling boil, it may splatter out of the pan. 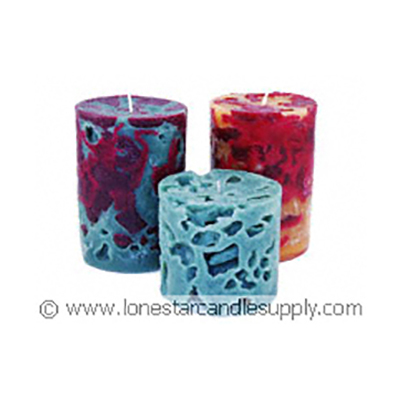 Check the temperature of the wax occasionally to make certain it is not getting too hot. Adjust the temperature as needed. 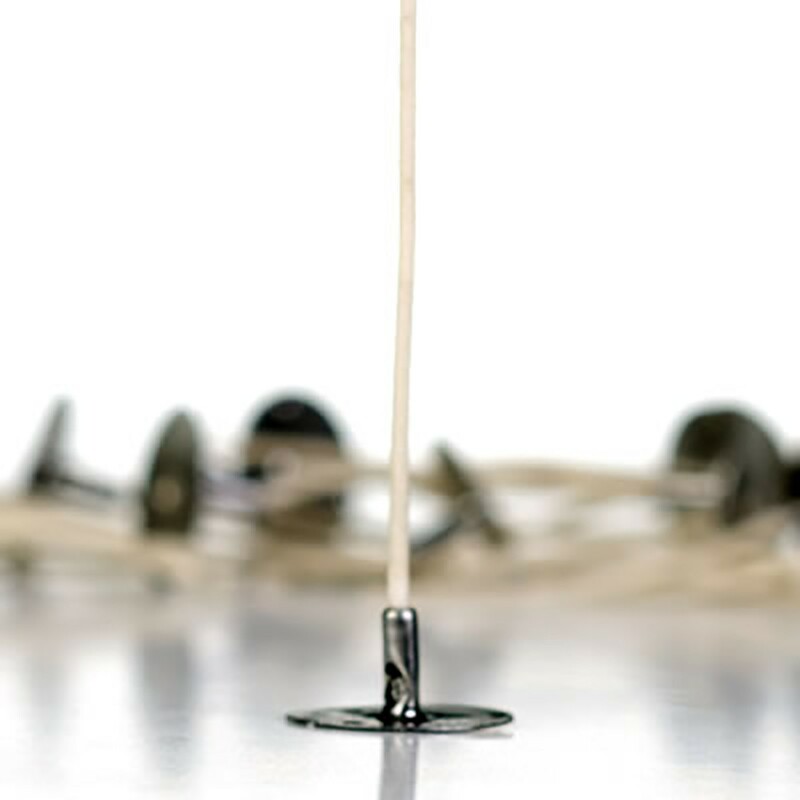 While the wax is melting you can continue with the next steps, but make sure that the wax is never left unattended. 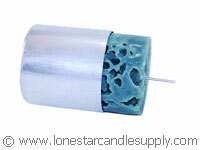 If you are using a wick pin, make sure the pin is straight and insert it into the mold. 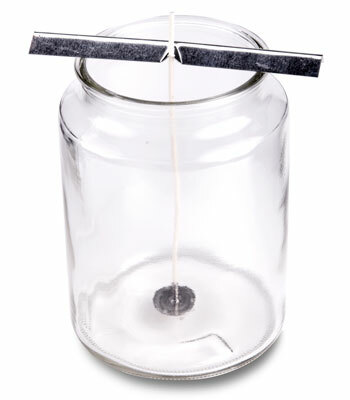 Don't forget to plug the wick hole in the bottom with a mold plug or putty so the wax doesn't leak out.If you are using a mold without a wick pin, string the wick through the mold making sure to anchor it at the top with a wick bar and at the bottom with the putty. Be sure to seal around the wick hole with the putty to create a good seal. Place the mold on an old cookie sheet or pan to contain the wax in case there is a leak. Completely fill the mold with crushed ice. An ideal size for the ice pieces is about 3/4 inch chunks. 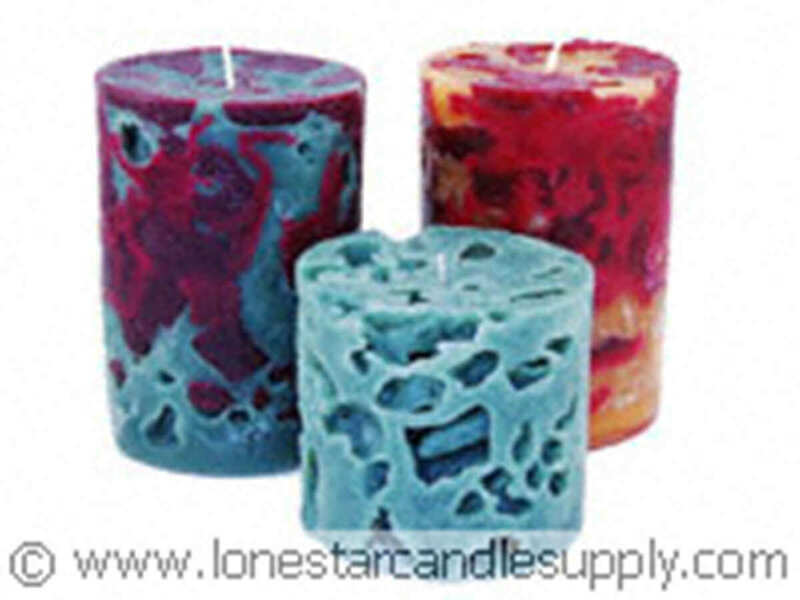 The ice will create holes in the candle as the wax sets, so the pieces should not be too big. 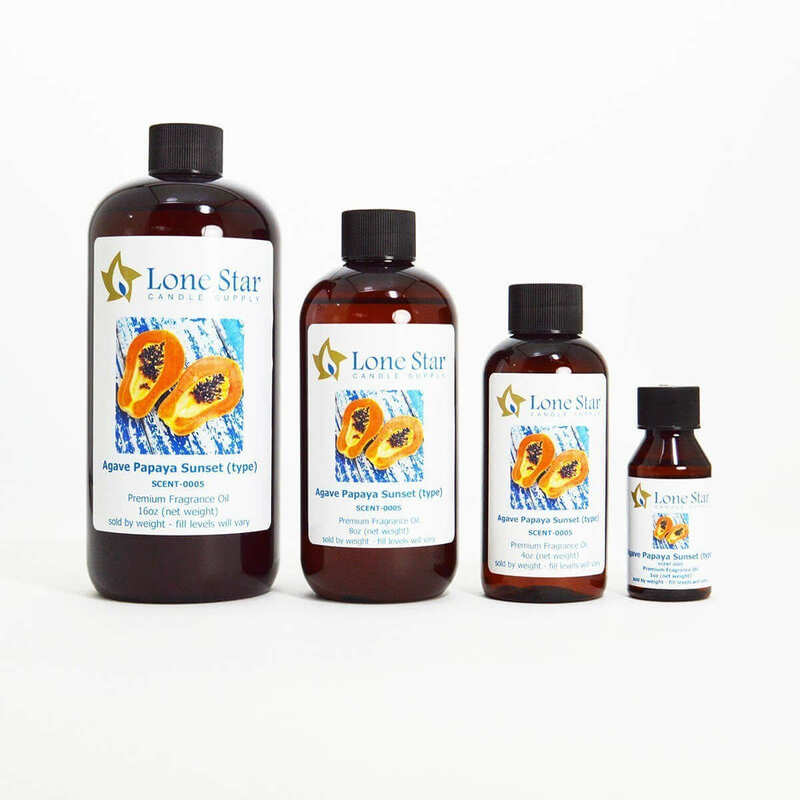 Once the wax has reached the proper temperature, you are ready to add the fragrance oil. 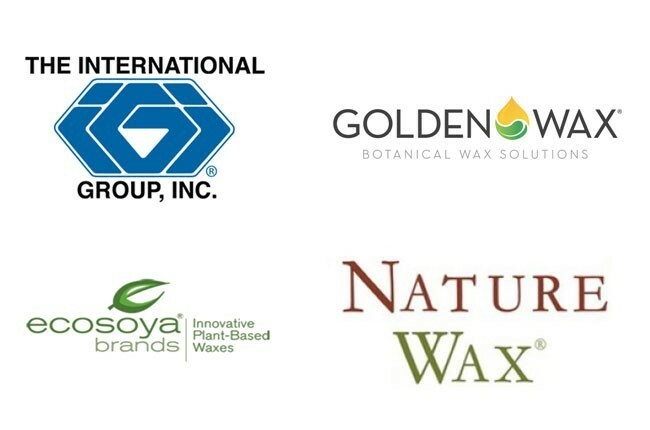 Depending on the wax you are using, you could add 0.5 - 1.0 ounce of fragrance per pound of wax. 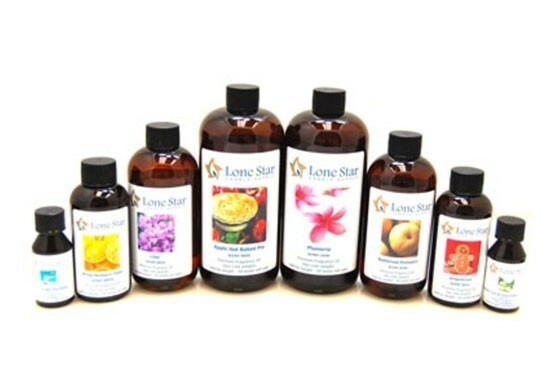 It is most common to add 1 ounce of fragrance per pound of wax. 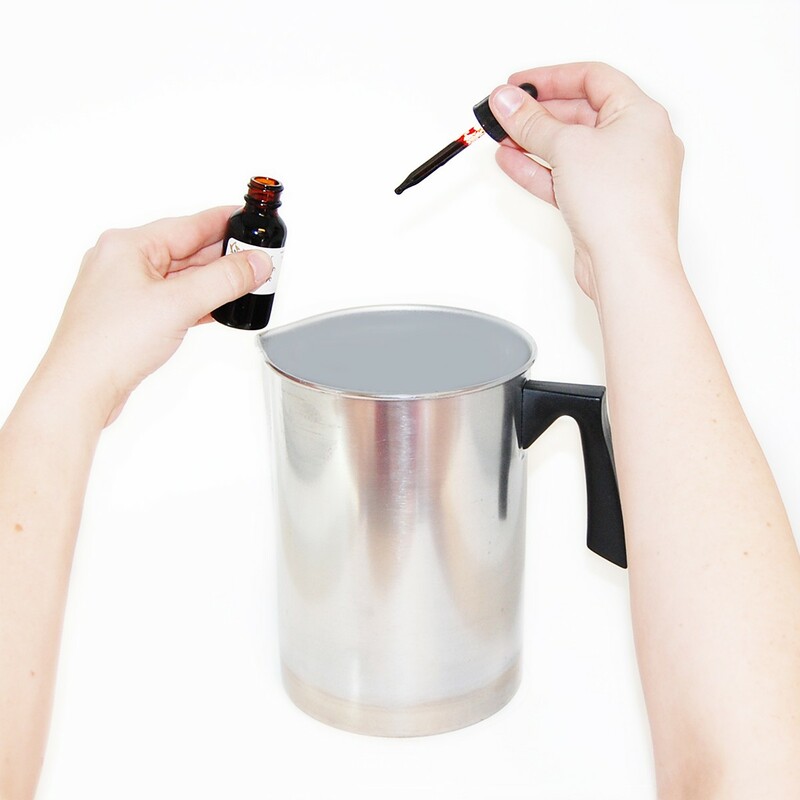 The fragrance is most accurately measured by weight, but you can also use a tablespoon to measure it if the scale you have does not measure a small amount precisely. 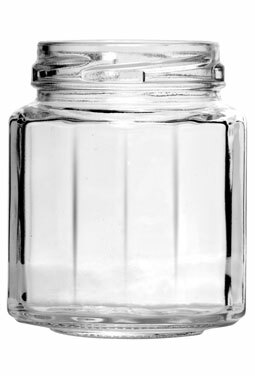 A tablespoon is equal to approximately 0.5 ounce. 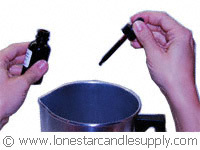 Pour the fragrance into the wax and stir for about 2-3 minutes or until the fragrance is completely "absorbed" by the wax. Next, add the desired amount of dye. 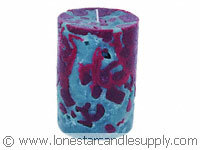 If using dye blocks, the block will melt into the wax more quickly if it is cut into small pieces. After adding the desired amount, stir the mixture until it is blended thoroughly. Skip to step 9 if you are using color blocks. 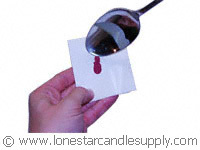 When you look at the liquid wax, it will usually look much darker than when it has completely cooled. 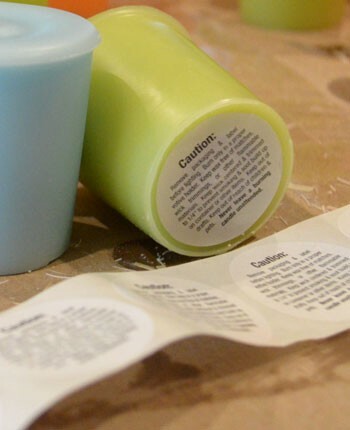 To test the color, you can drip a small amount of wax onto a paper plate or paper towel. Make sure not to drip the hot wax on your hands. 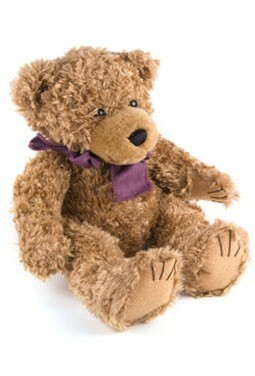 Allow it to harden, and you will be able to see a more accurate representation of the color. You can then add more dye if desired. At this point, you can add UV stabilizer if you choose. 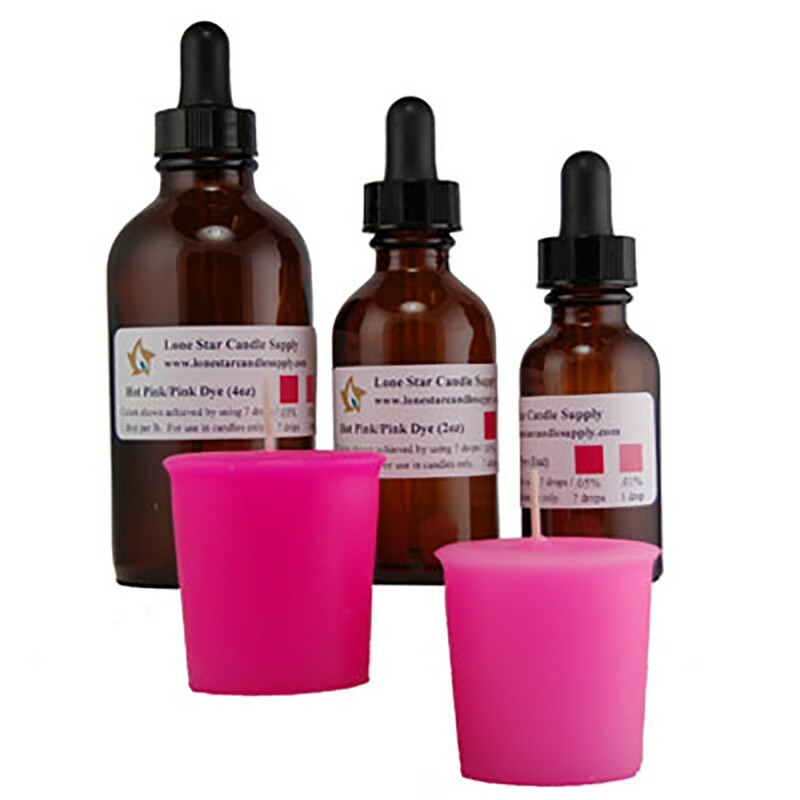 The addition of UV stabilizer will help keep the color from fading if the candles are exposed to UV rays or fluorescent lighting. You would add about ½ teaspoon per pound of wax. 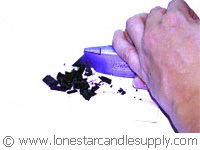 You will need to stir the UV stabilizer into the wax until it is completely dissolved/melted. Slowly pour the wax into the mold. 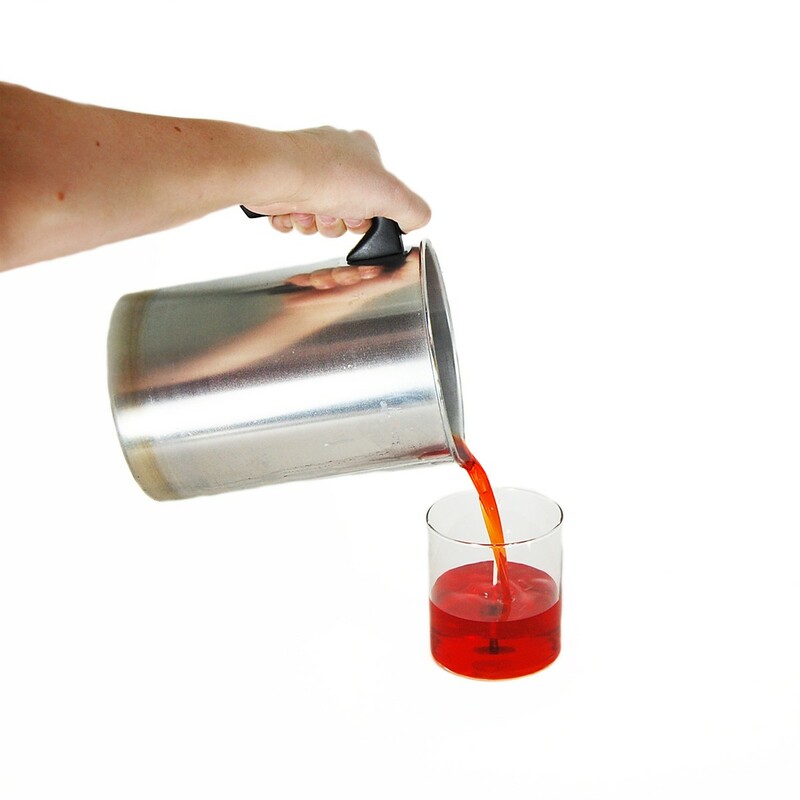 When pouring, slowly move the pouring pot around so you are not pouring in the same spot constantly. The wax will set quickly because of the ice. When the wax is completely set, slowly pour the water from the mold. If pouring the water into a sink, be sure to collect any small pieces of wax that may pour off with the water. 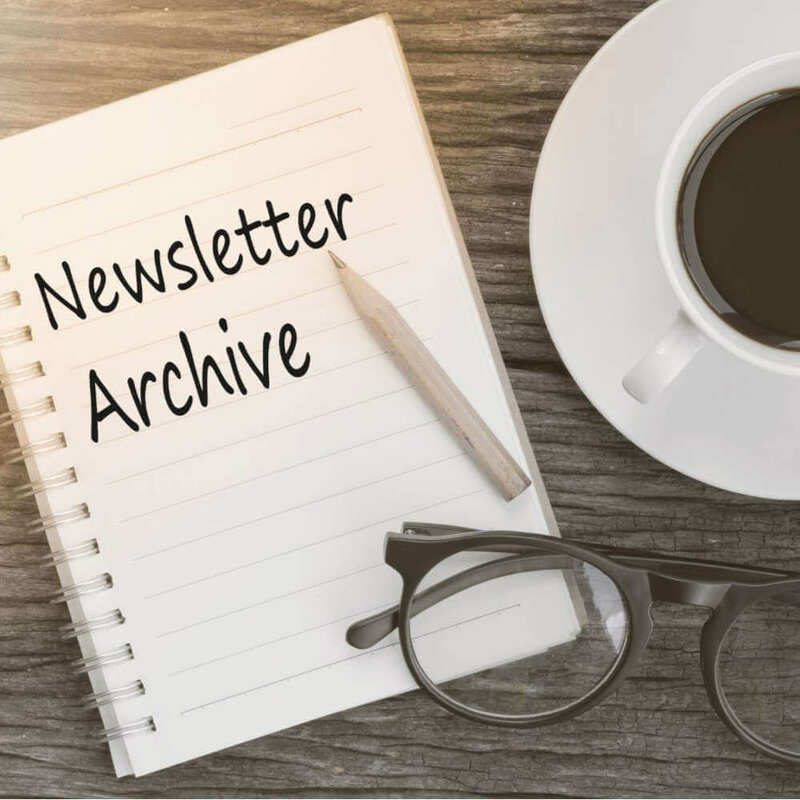 When you get to this stage, you have a choice. If you prefer to leave the holes, you are finished. 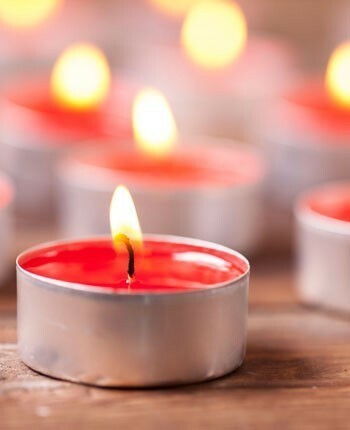 You can remove the candle from the mold, insert the wick if you used a wick pin, trim the wick and apply the caution label. If you prefer to do a second pour to help fill the holes, leave the candle in the mold. Fragrance and dye the wax for your second pour. Pour the wax in slowly making sure to move the pouring pot around so you are not pouring in the same spot constantly. 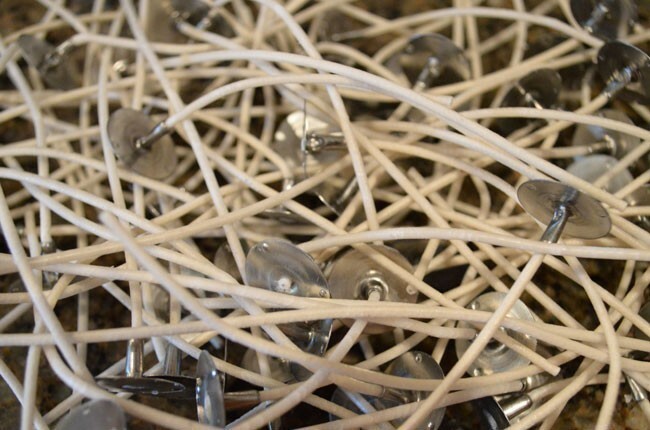 Trim the wick to ¼” length using wick trimmers, scissors or nail clippers. 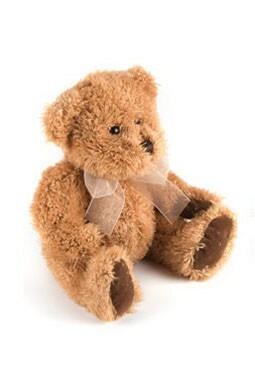 Be sure not to trim them too short because they would not burn properly. 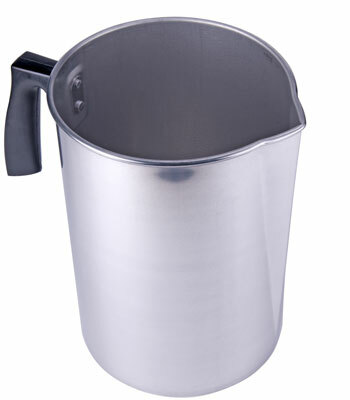 You may then put the lid back on the container. Your absolutely unique candle creation is finished! Are you ready to give it a try? 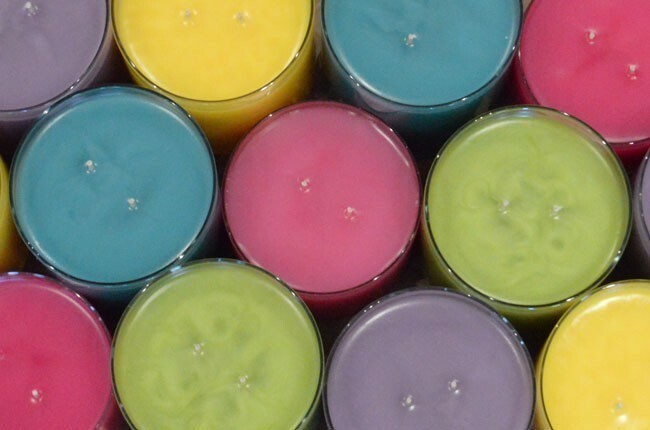 You may choose to order everything you need separately by browsing our selection of candle making supplies or you make click the links at the top of the page. 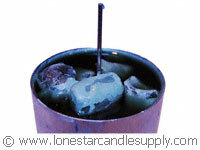 ***Please note - When burning ice candles, the wick will tend to burn down extremely quickly. 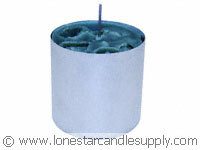 The holes that are created by the ice also create tunnels for the wax to trickle down the candle. 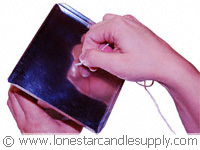 Be sure to place the candle on a holder or pillar plate to catch any wax that may spill over. There also may be small pockets of water remaining that did not completely drain off. This may cause the wick to crackle slightly. 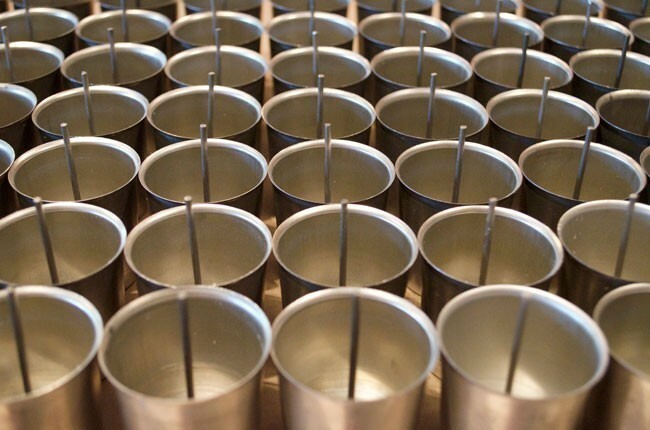 These candles are more suited for decorating than burning efficiently. 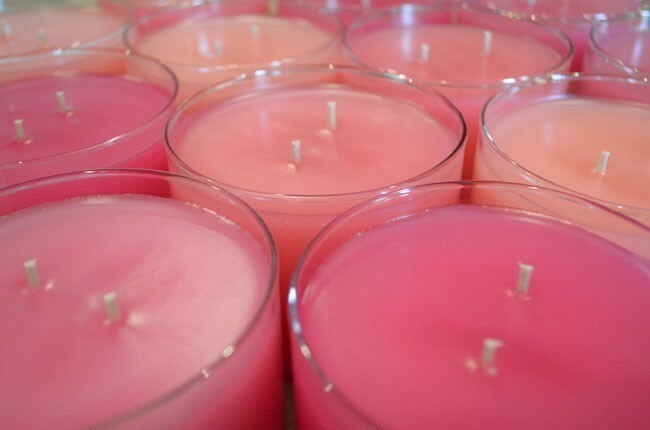 The second pour makes them more suitable for burning, but they will still burn differently than a pillar candle that is completely solid.